There are many job opportunities available for makeup artists. You can find job posts in local and national publications on a daily basis. But the job market can be competitive because makeup artists are in demand across a wide variety of industries. You need a fabulous resume if you want to have a shot at landing the job. Lucky for you we have a Makeup Artist resume sample that will get even glam-Queen Cher to hire you! It’s important to have all the bases covered when you are preparing your Makeup Artist resume because its content will be the deciding factor on whether you will get the job or not. Not many people realize that a career as a Makeup Artist can be a lucrative one. According to the Bureau of Labor Statistics, the average annual income of a Makeup Artist is $47,210. Not bad for a career where a college education is not required. Follow our Makeup Artist resume sample and you’ll be on your way! Certified and professionally trained Makeup Artist with over 10 years experience glamming up personalities in a wide range of media including TV, print ads, fashion runway and movie sets. Friendly, focused and fabulous; desirous of sharing world-class talents with an established movie production company. Works with celebrities, athletes and popular personalities in show business, news, and politics. Prepares personalities before makeup session. Conducts preliminary meeting with personalities to find out allergies, medical history, and preferences. Presents and collaborates with guests and other people in the industry on styles and applications of products. Recommends products for the company to purchase and for guests to use. Applies makeup, cosmetics, and other products to guests. Trains and orients new makeup artists. Creates and revises makeup and hair guidelines. Conducts touch up jobs on movie and TV sets. Conducted preliminary meetings with director and scriptwriter to find out appropriate hair and makeup. Coordinated with special effects department on hair and makeup styles. Applied makeup and other cosmetic products to guests. Shaped eyebrows, lip line, and facial hair. Design different looks according to the character. Recommended products for the company to use. Advised guests and company personnel on products to use. Conducted seminars in the studio for new makeup artists. Authored guidelines on makeup removal. Organized on-set preparation of all makeup and hair essentials. Provided consultation to clients prior to applying makeup. Oriented clients on which products to use. Advised clients on how to take care of skin and proper removal of makeup. Tasked with handling all bridal clients. Applied makeup, cosmetics, and other products to clients. Organized all on-site makeup activities for fashion shows and ad shoots. Negotiated with vendors on the purchase of products. Recommended and sold cosmetics to clients. Assisted in the removal of makeup after events. More than anything, in order to secure the job or assignment as Makeup Artist, you have to be very visual. If you will notice in our Makeup Artist resume sample, our Makeup Artist Michelle put in a link to her website. 100% sure the Hiring Manager or the proprietor will click on this link. The website is your marketing brochure on the Internet. It is the best way to get your potential employer to see what you can do without having set foot in his or her office. You can come up with a web page that showcases the work that you have done. You can also embed powerful testimonies and recommendations from clients. You can also include a blog page so you can highlight your expertise and thoughts on your profession. Hiring managers will also look for makeup artists with a wide range of experience. Makeup can be applied in a different number of ways. The more styles you know the better it will be for your value proposition. You will notice in the Makeup Artist resume objective that we started out by stating Michelle was certified. There are states and cities that require makeup artists to be certified before getting hired. By getting her certification front and center, we put any concerns on Michelle’s qualification to rest. We also emphasized her 10-year experience which is an important consideration for potential employers. The more tenured the candidate the fewer resources would have to be spent in getting the employee ready. We also took a playful approach to the Makeup Artist resume objective by adding the verb “glamming up”. It’s not really an accepted verb but it lightens the tone and brings attention to Michelle’s friendly personality. It is also for that same reason that the soft skills were presented in a light and humorous way: Friendly, focused and fabulous. In the makeup industry, after certification and training, the focus will shift on the intangibles. These are the soft skills or personality attributes that make you the right fit for the job. Remember that as a Makeup Artist, you will be working closely with people. As you well know, people have different personalities. Some will be difficult to work with. Some will be a joy to work with. 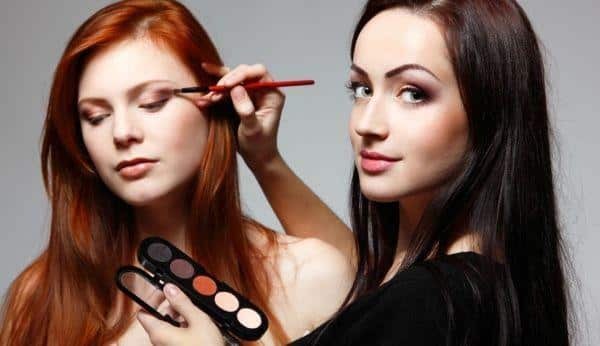 You should have the ability to get along with the guests or clients you are applying makeup on. Educational Attainment; as mentioned, a college degree is not a requirement to become a Makeup Artist. It will be an advantage however if your degree is in a course that is related to the job of a Makeup Artist. Whatever the case may be, always indicate your highest educational attainment. Certification; whether the city or state requires certification or licensure, it is better to get certified. It will always be an advantage over a candidate who is not certified. Indicate the organization that issued the certification. Friendly Personality; it takes patience and a pleasant disposition to work with some people. You might work during odd hours of the day or night which may increase stress levels and lower tolerance to those with an overbearing attitude. Highly Professional; many people would find the job of a Makeup Artist glamorous because you get to work with famous people. But you have to remain professional at all times and treat all clients in the same manner. Punctual; regardless of where you are designated, you are expected to complete the work on time. Production companies, movie studios, and networks run on a tight budget where every second count. You have to be on time at work so you can diligently go over details with the guest/ client and production people. Well Organized; if you are working for a busy company, you could be assigned to multiple projects or clients every day. These clients may have different needs. You should have the ability to organize your schedule and get everything ready without compromising time. Contacts – As a Makeup Artist, you will make a lot of friends out of your clients. They would not want to disrespect your employer by finding you another job. But they will not hesitate to give you information on better career opportunities. Build up your network and establish good relationships with them. Local and National Publications – These are traditionally good sources for potential employers to post ads. You should also consider newsletters and gazettes. Online Sites – You can also use popular online sites to find work. Many businesses use these websites to find talented makeup artists as well. Among the best websites, you can use are SimplyHired, Indeed, Monster, MakeUpArtistsJob, and GetMakeUpArtistsJob. Remember that your resume will always be a work in progress. Whenever you pick up a new skill or have new experience under your belt, you should keep it updated. Our Makeup Artist resume sample has been designed so it will be easy to update and improve your qualifications so you can land that new job. Need to see more resume samples and templates to better understand how to write a Makeup Artist resume? Here are more other resume examples for different job positions that you can use as inspiration.